Hello, could you please tell me if I can use the No.27 black ink cartridge in a HP Deskjet F2290 All-in-One or is it only No.21 that one could use in my kind of printer? Thank you very much for answering me. Unfortunately, the HP No.27 cartridge is not compatible with the Deskjet F2290 printer. We only recommend the HP 21 or HP 21XL black ink cartridges for use in the HP Deskjet F2290 printer as listed above. How do I use the scanner from the HP Deskjet F2290 printer with my computer? My HP Deskjet F2290 has printed one page and stopped. Why? If you've just installed new cartridges and the printer has stopped printing it's possibly a fault with the cartridges. I would recommend removing the cartridges, switching the printer off for five minutes and reinstalling. If the cartridges were working fine and have just suddenly stopped working it's possible that you have a problem with the printer. Do the HP 20 and 21XL cartridges work with the HP Deskjet F2290? Unfortunately, we do not advise that the HP 20 cartridge is compatible with your printer. Provided the printer was purchased in the UK, we recommend the black HP 21 or 21XL ink cartridges and the colour HP 22 or 22XL ink cartridges. As I'm using the HP Deskjet F2290 printer I would like to buy the refill cartridges through the internet,.Therefore, I would like to know which site is helpful to me because I didn't find my printer model listed on the HP website? Cartridge Save is a leading online supplier of HP ink cartridges in the UK. You can find all the printer cartridges you need for the HP Deskjet F2290 printer on this page and order them by choosing from the list (shown above). If you need any further assistance with ordering your cartridges, or wish to place an order over the phone, please call us on our freephone number. Made to last, the HP Deskjet F2290 will give you reliable results over and over again, ensuring that you can trust your Deskjet F2290 to give you the documents you need. The HP Deskjet F-2290 can print up to 20 pages per minute without causing any fuss so you know the HP Deskjet F2290 will give you the documents you need in very little time. If you need to use your HP Deskjet F-2290 on a regular basis you’ll probably know that constantly replacing the HP Deskjet F 2290 cartridges like the black HP Deskjet F2290 ink cartridge can lead to a hefty bill. You can try and compare HP Deskjet F2290 ink prices to find cheap deals or you can come to CartridgeSAVE. We are committed to getting you cheap Deskjet F-2290 ink cartridges at affordable discount prices so you know you can rely on us whenever you need a new HP Deskjet F2290 cartridge for your HP Deskjet F2290. We allow you to save time and money when you need HP Deskjet F 2290 ink fast because we know that our cheap deals and great service is exactly what you need. All our HP Deskjet F2290 cartridges can be ordered within a few minutes on our secure server or on our customer support line which is completely convenient to use. We send the HP Deskjet F-2290 ink to you via free delivery to ensure that you get the Deskjet F 2290 cartridge quickly, without fuss. We also have a strict no quibble money back guarantee policy for all the HP Deskjet F2290 ink cartridges so that you can try out your HP Deskjet F2290 ink and see whether it works well with your HP Deskjet F2290. The last model in the HP Deskjet 2200 series, the HP Deskjet F2290 is a multi-use printer that produces high quality text, graphics, and photos. It is also a scanner and copier in one, producing high resolution copies even of old and worn documents. It is an excellent choice for homes and offices; the lack of networking capabilities and absence of fax makes it unsuitable for bigger businesses. The HP Deskjet F2290 is a powerful machine, but it is not the best choice for high-use environments. The HP Deskjet F2290's design is very basic. It measures approximately 7.11x16.8x10.5 inches, making it a perfect fit for a desktop set up. It is also portable at 11 pounds, and uses 2 ink cartridges. It has a USB port at the rear for connecting to your computer, although connectivity is limited to this wired interface. The HP Deskjet F2290 has a flatbed scanner on top just like its F2200 series-mates. 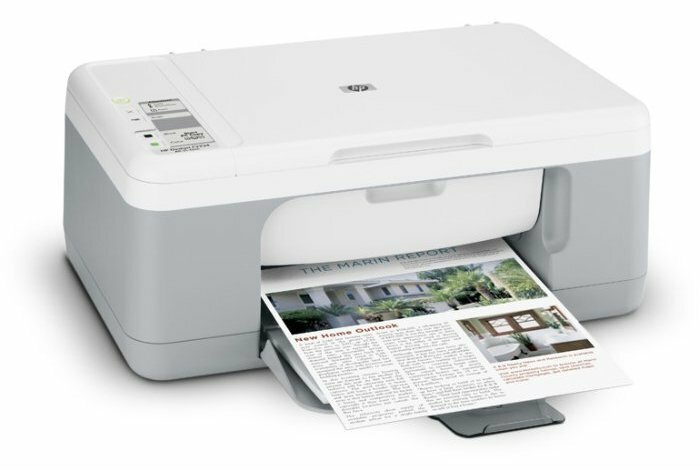 The HP Deskjet F2290 can handle a wide variety of media and is also capable of printing high quality photos with the use of an alternative black cartridge. It boasts print speeds of up to 20ppm in black and white and up to 14ppm in colour, while the scanner has a 48-bit colour depth, enabling it to recognise shades that the naked eye can't see. The HP Deskjet F2290 may not meet the needs of larger business settings, especially since it does not have networking capabilities and its duty cycle is only 1000 pages per month.